Having let this challenge lapse for several weeks, I’m now back on it and raring to go sharing my discoveries – because discoveries they are. In answering the questions I search my memory and come up with whole continents of forgotten reading territory. This Day 6 challenge is no different. In fact, because books very rarely make me cry, I had to look hard to find this one. I read Black Beauty by Anna Sewell years ago and the descriptions of the cruelty the horse met in the course of his life shocked and upset me. As it was meant to do. Ms Sewell wrote the book to do exactly that – shock her readers into looking anew at animal welfare. Reading the Wikipedia writeup of this book I was very happy to learn that she achieved her aim. Also, as a result of her book the conditions for hackney cab drivers in London were improved. Another demonstration of the power of the pen and how one person can make a difference when wielding it. 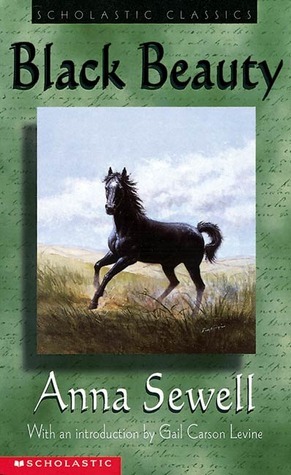 For those who aren’t familiar with this book, it’s an ‘autobiography’ of a horse. Black Beauty is sold from owner to owner and experiences the full range of human kindness and unkindness. Ms Sewell had mobility problems due to an accident as a teenager and was dependent on horse-drawn vehicles. This gave her a deep respect for horses and an understanding of their behaviour, both of which she used to good effect in her only book. At the time (1877) writing from an animal’s viewpoint was a novelty and affected readers more than it would do today. Picture from Goodreads which also has a short review. Thank you for stopping by and sharing your love of the book. Apparently the writer didn’t intend it for children, but I think most of us read it as a child and it acts as a good introduction to animal welfare. That book (and that movie) have scarred me for life. The biggest thing I learned from the story is never to sell/give away your animals. BB starts out with really good owners and is very well taken care of, and then each new owner is a step down the ladder. And by the end my overly-apathetic heart is preparing to explode. Even if you think you’re giving/selling them to a good home, you can’t control what will happen if the new owners have to give away/sell the animal down the road. Or (more of a problem in modern times) the animal could be just abandoned. If I adopt an animal, I adopt it for life, and I think that’s because of this book. God I’m going to cry just thinking about it! Thank you for sharing your experience and learning. I think Anna Sewell would be thrilled that her book is still influencing people to be concerned about animals. I agree that adopting an animal should be for life, although I suppose occasionally it isn’t possible.